Minersville School District v. Gobitis, 310 U.S. 586 (1940) & West Virginia Board of Education v. Barnette, 319 U.S. 624 (1943). People similar to the Gobitas kids were being persecuted in Germany and the U.S. at the same time. The National Socialist German Workers' Party had been in existence since 1920 and had electoral breakthroughs in 1930 and dictatorship in 1933. Were Germans in the United States and in Germany inspired by forced flag fanaticism in the U.S. that led to cases such as Minersville/Gobitis, originating in 1935 and holding (up to and beyond the 1940 Supreme Court decision) that children could be persecuted for refusing the robotic chanting and the one-armed salute? Minersville/Gobitis was not overturned until the case of Barnette (1943). Much has been written about atheism and atheists. Most work would improve with greater details about contemporary atheists in the news. For example, an atheist has litigated against the phrase "under God" in the Pledge of Allegiance. Some atheists seem intellectually dishonest in droning on about the two-word deification in the pledge, while ignoring everything else about it. That is because many atheists are also socialists. The man who forced generations of schoolchildren to mumble in fear each morning died on Thanksgiving, more than a half-century after he brought McCarthyism to the classroom. Docherty’s first sermon on the subject fell on heathen Harry Truman’s deaf ears. But a second attempt at Constitutional subversion in 1954 found Seventh Commandment violator Dwight D. Eisenhower in the pews, and by Flag Day that year Ike signed the revised Pledge into law. Docherty was right. He was wrong when he thought that altering the pledge solved the problem. The President (Eisenhower) and Congress were wrong along with Docherty. But that was the case nearly every time they made any decision at all about anything. This is why references to God on money and in the pledge of allegiance were added in the 1950s because of a single pastor who preached that America had to demonstrate that it’s totally different from those godless socialists. 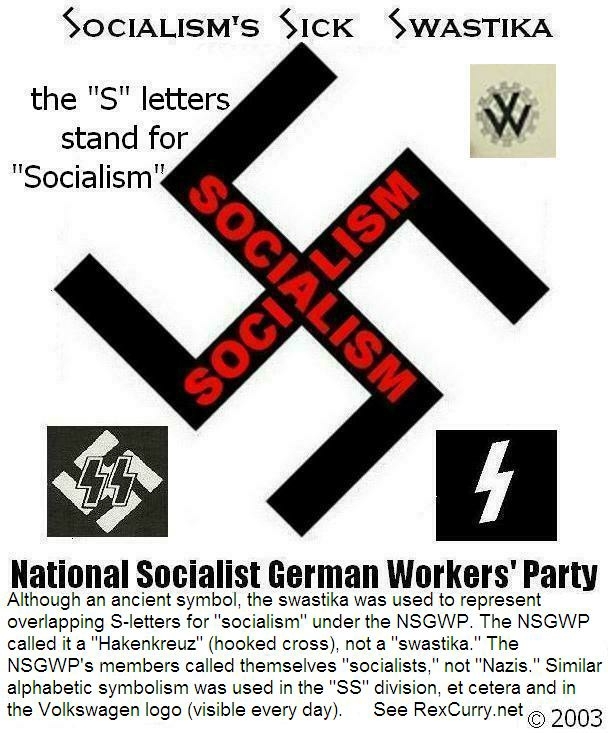 It is entirely consistent with "Christian Socialism" preached by the Bellamys and their ilk. It is as if the Bellamys and there ilk intended no difference between the USA's socialist police state and that of the former Union of Soviet Socialist Republics, other than the phrase "under God." "As a child, I remember seeing footage of school children in the USSR pledging allegiances to their country. This footage was always shown in the context of look at this scary country brainwashing their children. I always wondered what was the difference in what my class was doing everyday?" - a fan. The Rev. George M. Docherty has cashed in his chips. I, for one, must temper my grief for the death of this unwitting friend of tyranny. And why do I call him so? Because he induced that pack o' ho's that we call Congress to add the phrase under God to the Pledge of Allegiance. I don't object to the phrase because it twists an affirmation of Caesar that every American can endorse into an affirmation of the Deity that some Americans cannot, although that is what it does; nor do I object to it because it turns the phrase one nation indivisible into one that is either meaningless or redundant, although it does that, too; nor do I object to it because it destroys the beautiful rhythm of the original, although it also does that. No, I object to it, because it represents an assertion of power on the part of the aforesaid pack o' ho's that scares the living daylights out of me. Nowhere in the United States Constitution is the power given to Congress to re-write works of authorship. The man who wrote the Pledge, whom I shall call Francis Bellamy for the sake of convenience, is an author. The same, in essence, if not in stature, as Shakespeare, Dante or St. John. What he wrote is what he wrote. Neither he nor any other author should have his work re-written by the State to suit itself. If the State doesn't like Mr. Bellamy's Pledge, let the State write its own dam' Pledge! I could fulminate for pages, but it is enough to say that what Congress did is what the Ministry of Truth would have done in the same circumstances. 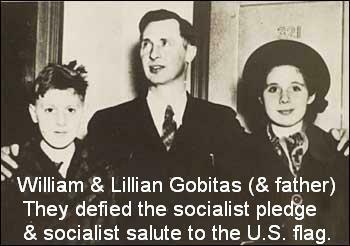 William Gobitas ( Billy Gobitas ) and Lillian Gobitas (Gobitas was the actual spelling of their name. Not William Gobitis ( Billy Gobitis ) and Lillian Gobitis ).